Swashers, Books, Costumes and more! Gear up for adventure with our foam Swashers™, Adventure Quest game book, costumes & accessories, & more. All our products can be purchased when signing up for our programs, and delivered to your child at their Questing location. They can also be purchased separately, and picked up at our office (please contact us to arrange a pickup time or delivery option). These products make a great addition to a birthday party, along with other add-ons like gem-filled party puches. Visit our secure Online Store by clicking the button below. It will open a new window with our online storefront. What are Swashers and how are they Used? 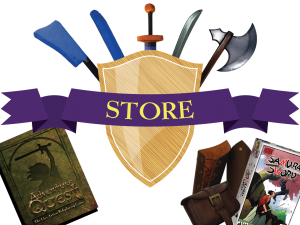 Note: We don’t hold quests at our business office, however, you can visit us here to purchase cool Swashers, books and questing gear! Our office is located above BAAY (Bellingham Arts Academy for Youth). Our office hours vary, so please call or email in advance if you’d like to meet us there. Additionally, the outside doors of the building are often locked, so please call us when you arrive so that we can let you in and show you up to our office.